Prevail StretchFit briefs have stretchy panels that are easy to grab, pull and attach for an adjustable fit that is secure and comfortable. 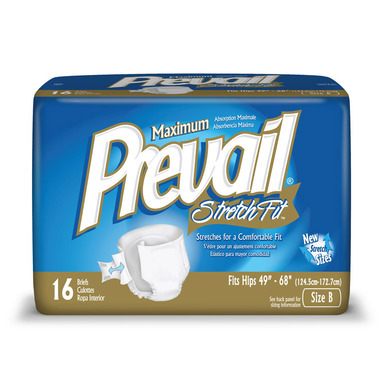 With Prevail StretchFit stretchy panels fewer sizes are needed - a 4-size brief system is reduced to 2 sizes of Prevail StretchFit briefs. Size B briefs are suitable for waist sizes 49" - 68". This case includes 6 bags of 16 briefs (96 briefs). Fab product. Durable, great absorbency, comfortable, well made product. Well made product. Recently re-designed for greater absorbency and fit. Recommended. Fantastic product. All of my Mum's caregivers love this. Great fit, easy wide tabs for closures, comfy material. Will re-order again and again.